Cambodia, and especially its capital Phnom Penh, is just subjected to Air Pollution just like any other countries in Asia. 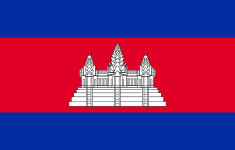 Cambodia ranks 162nd (out of 178 countries) at the Environmental Performance Index for Air Quality. This air pollution problem, just like other countries is South Asia, is becoming even more important for World Heritage Sites like the Angkor Archeological Park (Siem Reap) - due to the hundreds of tuk-tuks and buses carrying the tourist (check this article). You can read useful advices from the US Embassy on Phnom Penh "Dirty Air", or this interesting blog post about "Air pollution is hardly Cambodia’s highest priority". Like most of the countries in Asia, there is no reason why there should not be real-time Air Quality monitoring in Cambodia, at least for Phnom Penh and Siem Reap. Unfortunately, there is not much information about real-time Air Quality data from the Ministry of the Environment (MOE). And projects like the ASEAN-German Clean Air for Smaller Cities looked promising, but did not provide any tangible monitoring result. The best solution for providing real-time Air Quality information in Cambodia is for the MOE to start providing official hourly AQI readings. But this can, sometimes, take more time than expected. Light but visible Air Pollution on Phnom Penh Skyline (attribution). Unless data is made available by the authorities, the World Air Quality Index project recommends to start publishing real-time data using some of the affordable air quality monitoring stations, such as the GAIA A12 (picture on the right). If you are interested in knowing more about this initiative, or about helping to host a station, then please contact us with the form at the bottom of this page. Enter your name - eg "John Doe"
Enter your email address - eg "john.doe@mail.com"
Write few words about your request - eg:"I live in Siem Reap, and would like to help for preserving our heritage. ", "I would like to help by hosting an monitoring station", "I would like to know the average daily air quality for the past year", ..
Do you want to view all the other on-going country monitoring programs?